The Chancel is one of the oldest parts of the church dating from the thirteenth century. It has undergone considerable restoration but the three lancet windows on the north side and the large east window formed part of the original design, although the stained glass is of a much later date. Either side of the east window are tablets containing the Ten Commandments. A drawing of the church in about 1780 shows two small windows, two large windows and a door on the south side. It is believed that the door (which was used by the Priest to enter the Chancel) was filled in and the three windows rebuilt to match those on the north side during the 1846 restoration, but the doorway can still be seen in the exterior stonework. All the capitals of the shafts (i.e. the carvings at the top) on both the north and south sides of the Chancel either side of the six windows have floral designs, except two. The one nearest the altar on the north side takes the form of serpents biting each other and probably dates from the early to middle thirteenth century, with other examples being found in Wells Cathedral. St George’s, Windsor contains numerous carvings of dragons, linked to the legend of St George, and dragons and snakes are closely related in mediaeval art representing evil and temptation – hence they are often depicted biting each other or being defeated by the figure of Christ. However, such carvings do not always imply religious or moral connotations because sculptors of that period often had no restrictions about the subject of their work. 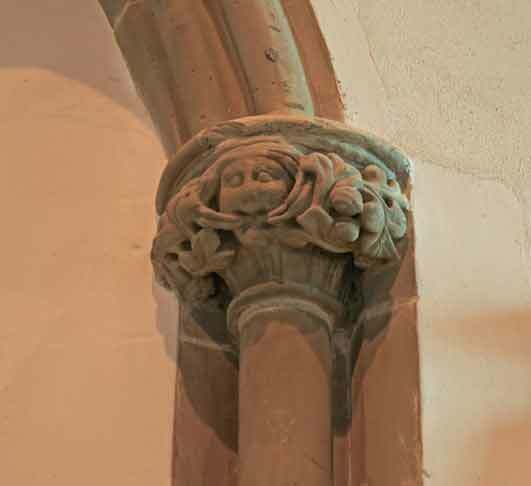 The eastern pillar of the left-hand window on the north side has a face peering through foliage. An ancient belief called animism (whereby spirits inhabited plants, trees, rocks and other natural phenomena such as mountains or rivers) persisted in pagan traditions for many centuries and often resulted in the objects being regarded as part of the community. A spirit could vacate a tree in the form of a forest god, and in art this was often depicted as a change into human form that retained branches and leaves, particularly around the head. Such a figure was known as a “Green Man". There are two gargoyles at the end of the curved arch above the large east window. Such carvings often represented local personalities and, since one is male and the other female, it is believed that they represent Richard & Joan de Plaiz.